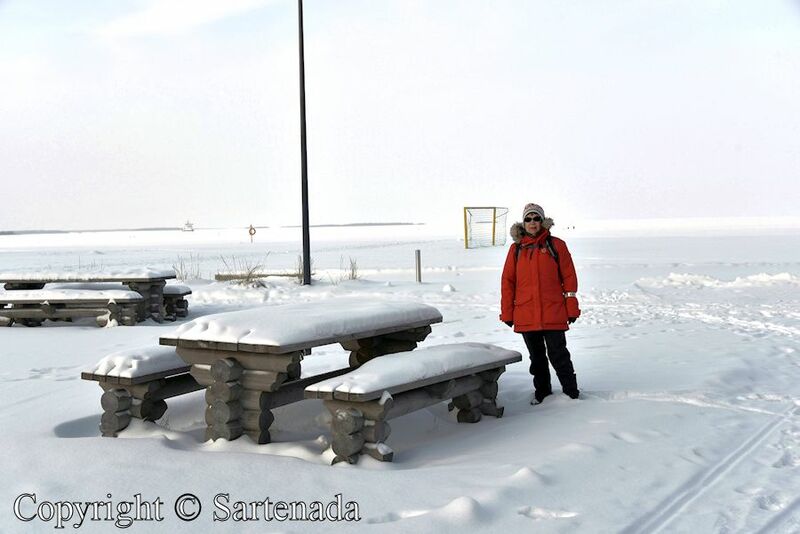 In February we visited the Arctic beach of Nallikari in Oulu again, but this time in Winter. The scenery was very different from that which we saw in summer. 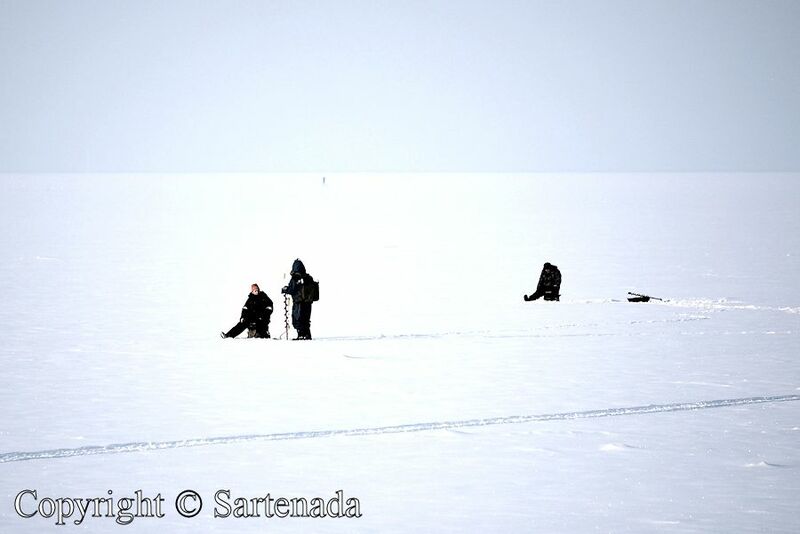 Due to snow it was very difficult to detect where the beach ended and where the sea started. Was there anything than snow to see? Yes. 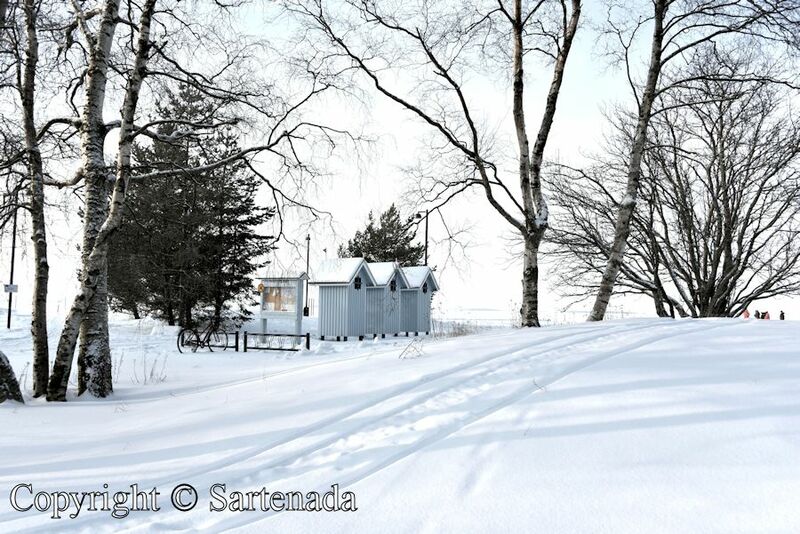 Winter bikers, bathing huts, ice breaker, empty life guard’s hut, some ice fishers, tracks of bike’s winter tires, hays that Winter was not crushed. So small things, but our expectation were not big. 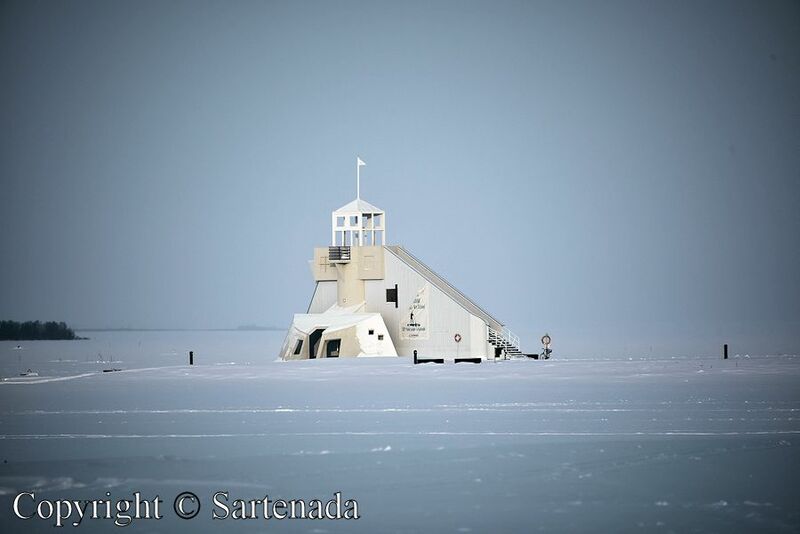 En febrero volvimos a visitar la playa Ártico del Nallikari en Oulu nuevamente, pero esta vez en invierno. El paisaje era muy diferente de lo que vimos en verano. 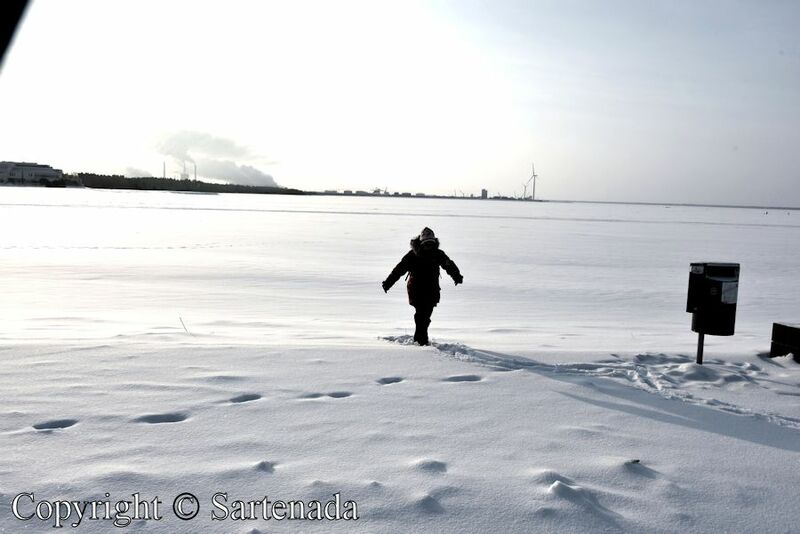 Debido a la nieve que era muy difícil de detectar, donde terminó la playa y donde se inició el mar. ¿Había algo más que la nieve para ver? Sí. 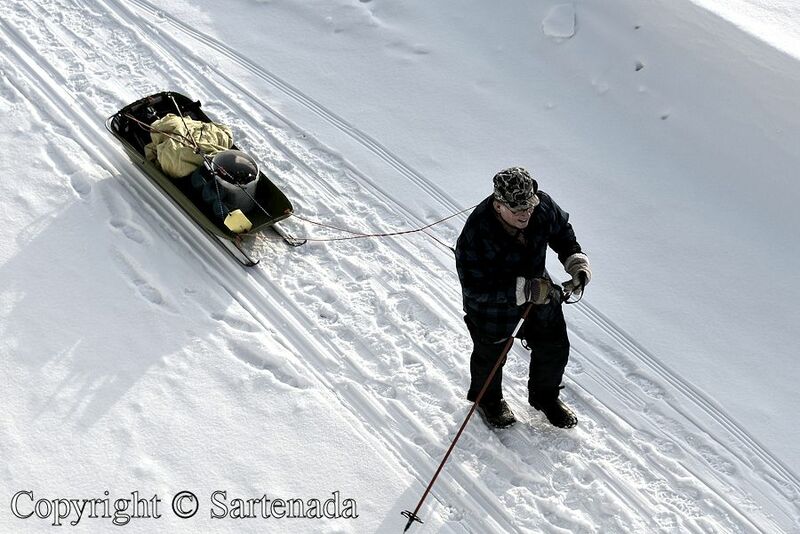 ciclistas de invierno, casetas de baño, el rompehielos, la caseta vacía de guardia de la salvavidas, pesca en hielo, pistas de neumáticos de invierno de bicicleta, herbes que el invierno no fueron aplastada. Tan pequeñas cosas, pero nuestra expectativa no eran grandes. Y avait-il quoique ce soit que plus la neige pour voir? Oui. 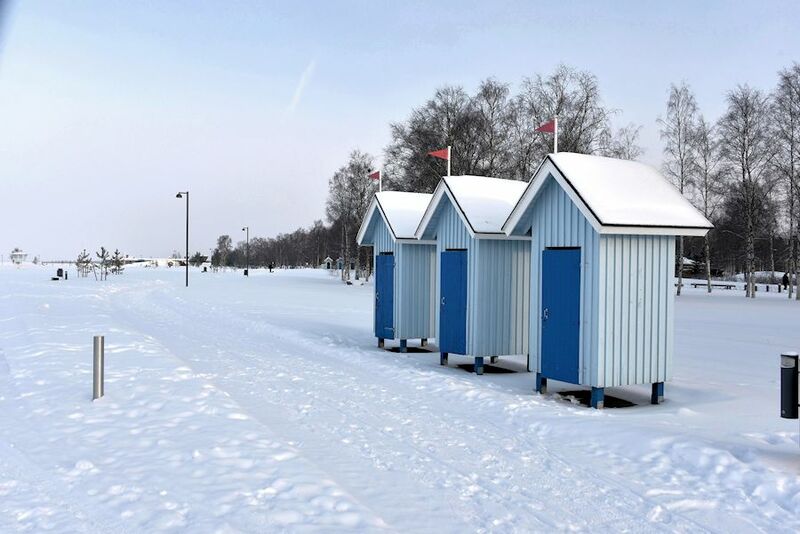 cyclistes d’hiver, cabines de bain, brise-glace, la hutte de vide de surveillant de baignade, pêche sur glace, pistes de pneus d’hiver de vélo, herbes que l’hiver n’a pas été écrasé. 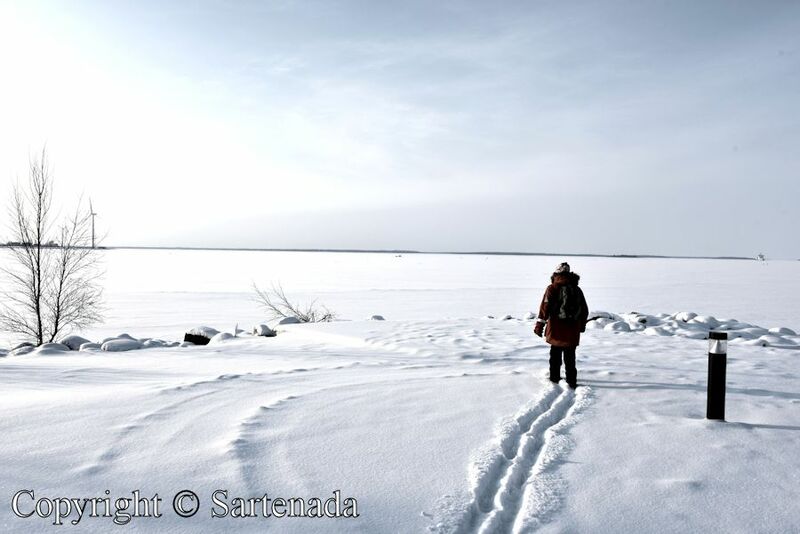 Donc, peu de choses, mais notre attente était pas grand..
Em fevereiro visitamos a praia Ártico de Nallikari em Oulu novamente, mas desta vez no inverno. O cenário era muito diferente do que vimos no verão. Devido a neve, era muito difícil de detectar onde a praia terminou e onde o mar começou. Houve alguma coisa que a neve que a ver? Sim. ciclistas de inverno, quebra-gelo, o cabine vazio de nadador-salvador, cabanas vazios de banho , pesca no gelo, faixas de pneus de inverno de bicicleta, as fenos que o inverno não foi esmagado. Então, coisas pequenas, mas a nossa expectativa não eram grandes. Arctic beach in summer / Playa ártica en verano / Plage arctique en été / Praia árctica no verão. immensi orizzonti, grande festa di bianco e di luce accecante, anche io ricordo così l’artico! Grazie mille. Sono contento che, Ti è piaciuto le mie foto. Such beautiful snow! How cold was it then? How cold – my wife checked it from her daily diary and she said -7C, but there was cold wind, which made it feel colder on the skin. 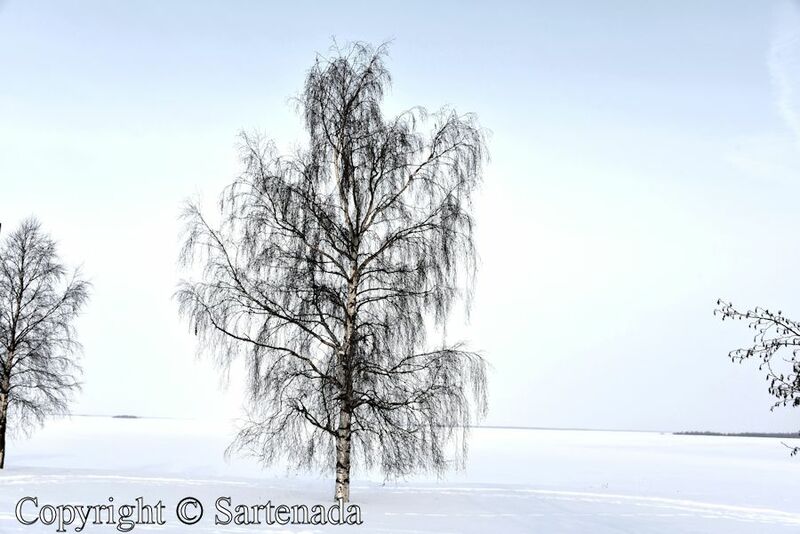 In Finland we have always check the real feel in winter due to cold wind. Thank You for Your kind comment. Merci pour la remarque je saurai la retenir. It looks so cold but beautiful. These sceneries seem to resemble Hokkaido. very well. I am glad that You left Your comment. Thank You. Bonjour Matti, une belle découverte, cette plage arctique !! J’aime ces grandes étendues à l’épais manteau de “sable” et ces petites cabanes qui rappellent celles des plages normandes ! Mon cœur chante en lisant de votre belle commentaire. Merci beaucoup. Each of them shows unexpected “treasures” which make this post a small jewel! So nice comment. Thank you. This beach differs very much from it when seen in summer. I am sure that You remember my post. Fantastic photos! I feel truly transported and a little cold ;). Thanks for sharing. I am glad that You loved my photos. Thank You for your kind comment. Je apprécie votre commentaire beaucoup. Merci. I’ve never seen a beach quite like this one. The snow and ice are amazing. These photos are gorgeous. How nice to read Your kind comment. This beach has two faces: in winter and in summer. Anything is splendid snow scene. Snow melts and greets spring in Japan. I am always amazed by the pictures you take! These, with snow-clean style are fabulous! Snow was indeed pure white and we loved it. 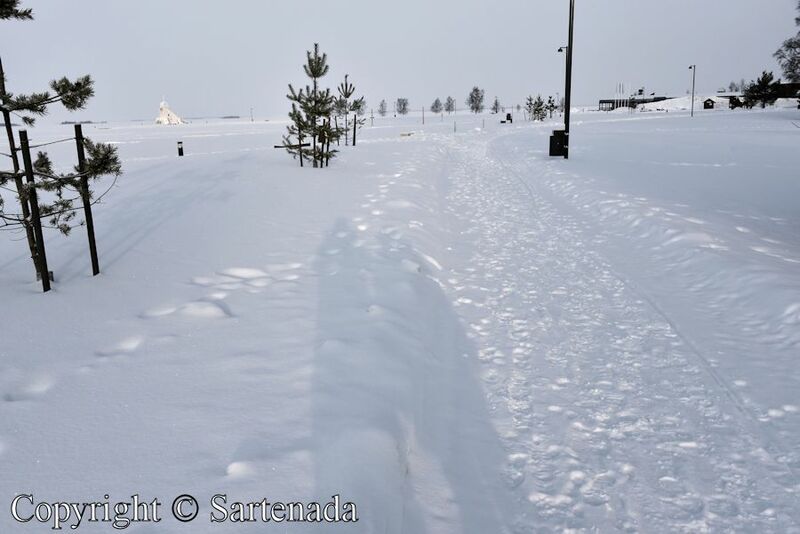 In Oulu snow stays long time white comparing to some southern places. Thank You for Your kind comment. It was well worth a winter visit! It’s nice to see so many people enjoying the spot–your photos are great! Thank You! Visiting this beach stays long time in our minds. 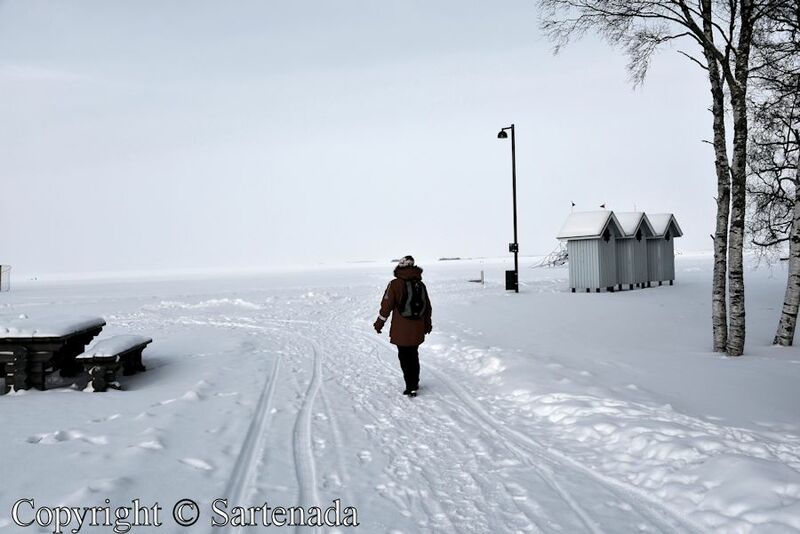 Fabulous snow-clad sceneries,all is so pure,so white and brilliantly sparkling!The blue sea and the shore have incredibly become one,the Arctic beach has been transformed in a vast white space.Few places boast such striking winter beauty.Your photo series is out of this world! Oh, thank You for Your praising words. I am flattered. What a contrast from summer to winter! I like the bikers silhouetted against the snow and white sky. The bikes look quite heavy duty, they must be built especially for snow riding. Beautiful photos! Contrast is indeed great. I think that those bikes are some kind of mountain bikes with “huge” tires. 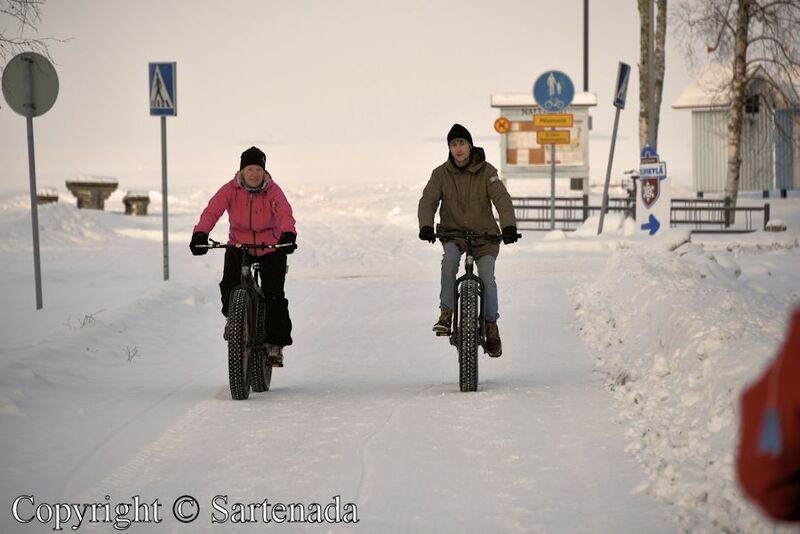 Winter biking is very popular in Oulu. 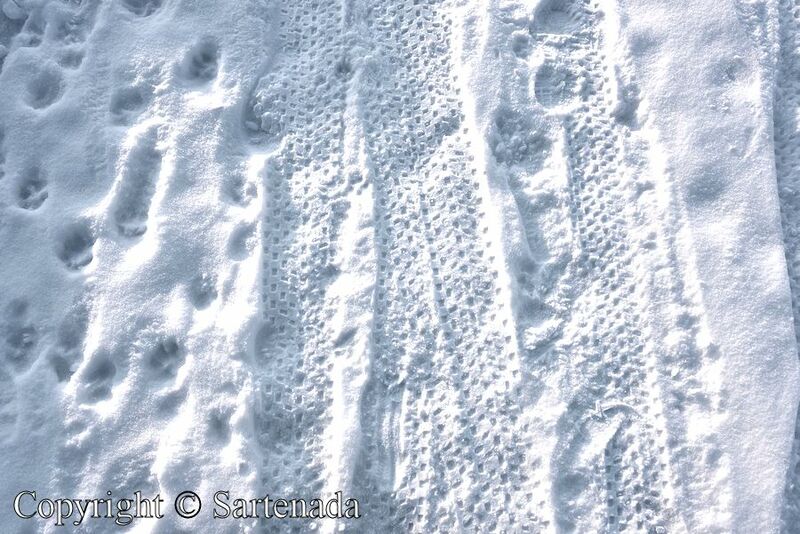 When next winter starts, I’ll present winter biking photos. I am glad that You checked also summer photos to get the difference between summer and ice. Thank You. The winter beauty of that beach rivals its summer beauty, although visiting it would require more effort. We were lucky when visiting this northern beach, because day before there was snowfall. Thank You. Qué maravilloso reportaje! Ante la imposibilidad de ir a tan bellísimo lugar me conformo con recrearme con tus fotografías. Muchísimas gracias. Me alegra que te gusten mis fotos. Muchas gracias a ti por tu comentario. 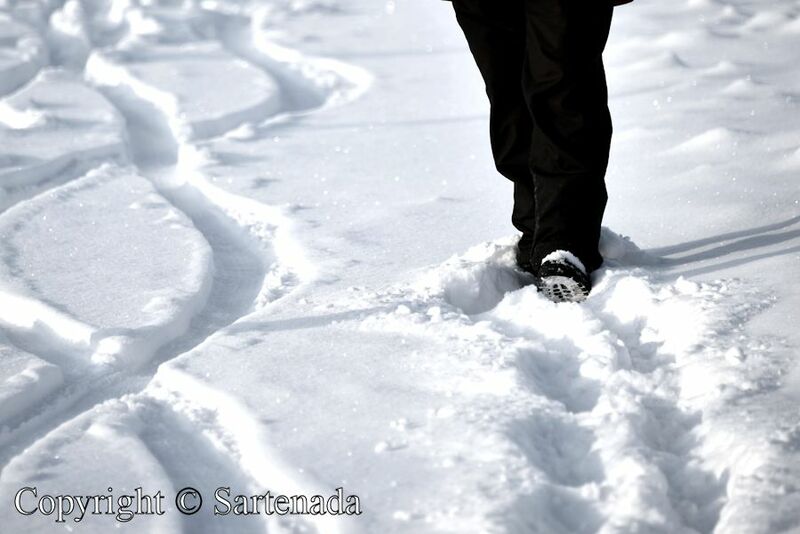 Marcher sur la glace et la neige blanche pure sont des expériences merveilleuses. Merci beaucoup. Wowowow > I always love it when you do a post. These photos are amazing. Great photo of the ice breaker. When will things start to thaw where you are? It sounds like you’re having a marvelous time. Whenever I see your photos I want to be there but these are a bit special. Fantastic! Thank You for Your nice comment again. Yes. 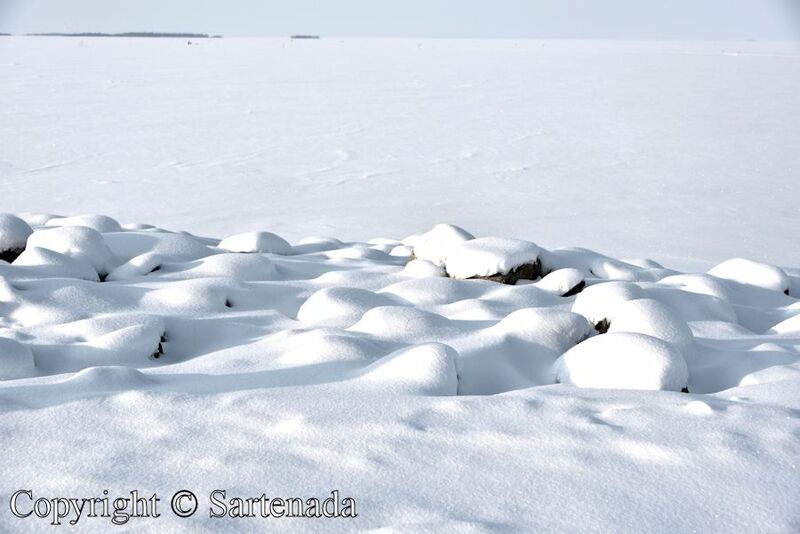 In winter, the shoreline is impossible to see due to the snow. Thank You. Looks so cold over there. Well, cold and cold. In Finland, we have saying: Cold is only matter of dressing. 🙂 The temperature was only -7ºC / 19.4ºF, but the real feel was colder due to the wind. Thank You commenting. I love to play in the snow! As long as you dress properly the winter wonderland awaits. Beautiful photography. You are right. 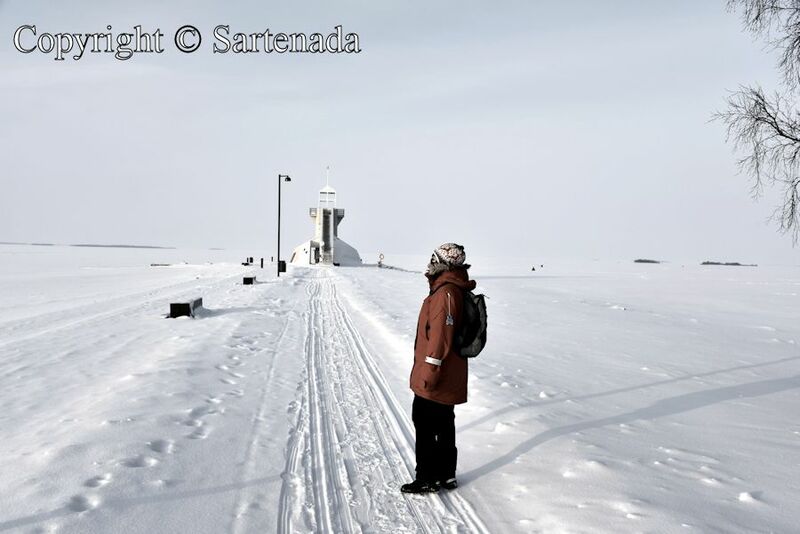 In Finland, we say: Cold is only matter of dressing. 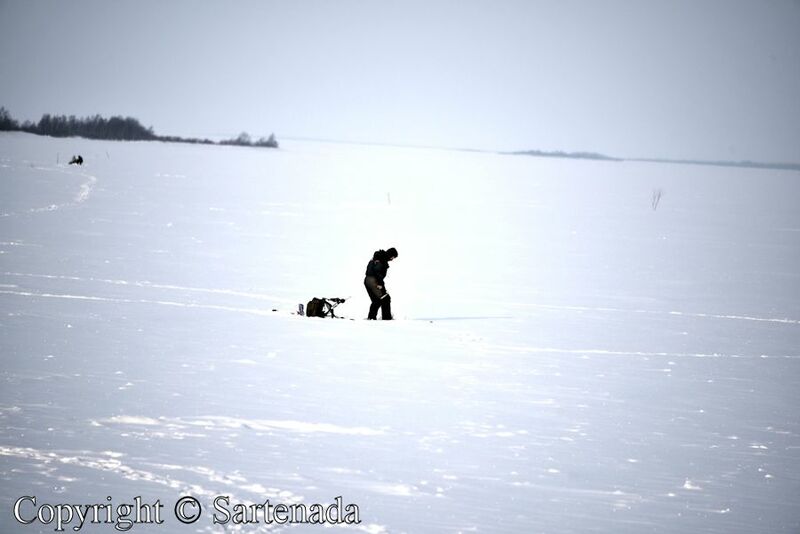 This winter the coldest day was -33ºC / -27.4ºF. 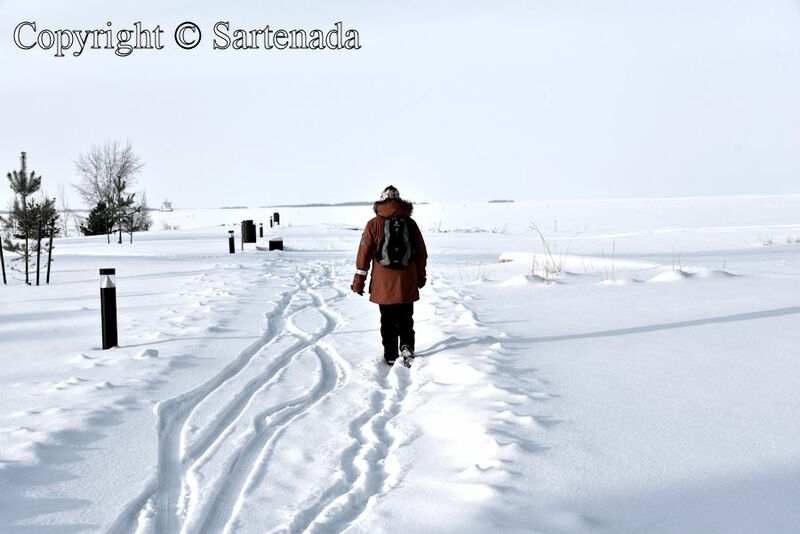 We did not feel cold, but I have confess, that our daily walking routes were quite short then. elles sont très belles. Je te souhaite une belle journée. Icy, icy – but so beautifull! And so different from your summer photos, Matti! You really can’t recognize the end of the beach and the beginning of the sea. Impossible. Apart from your gorgeous snow photos I really enjoy to see your great photo of the ice breaker! Impressive! 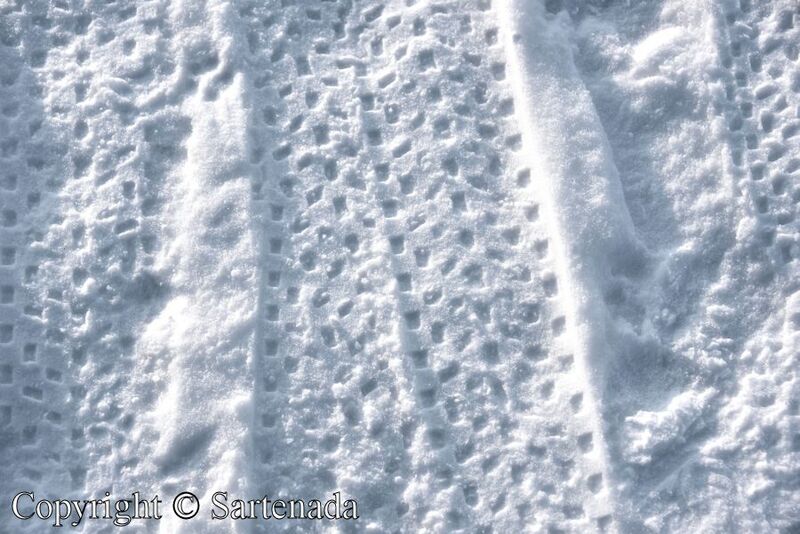 I admire the cyclists in the snow but I notice that their tyre tread ist very special and marked. It surely gurantees a rather good grip. Thank you. You have noticed many things in my post. 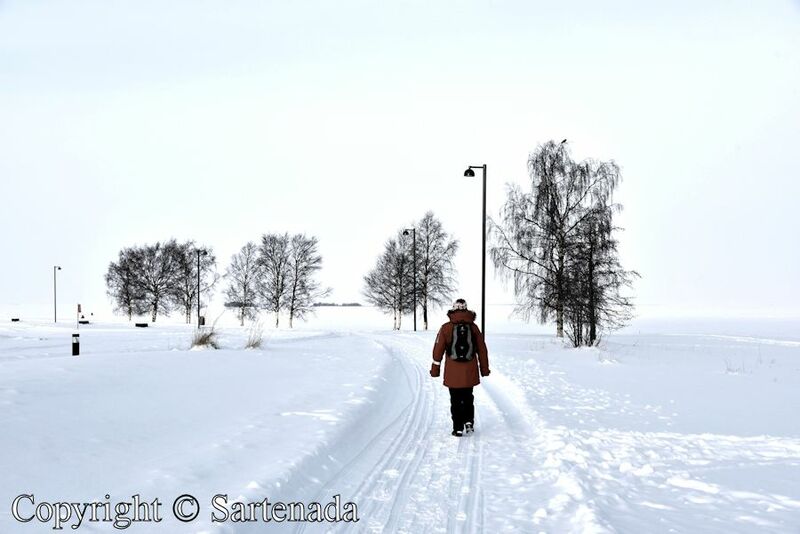 Because winter biking is very popular in Oulu, I have decided to make a post about and publish it in the beginning of next winter. 🙂 Icebreaker waited that ships, which need assistant, call it to help them to pass thru in the ice. You know it that snow and winter are beautiful seasons. I am glad that You loved my photos. Thank You. Silver of the world is great. However, very cold likely. 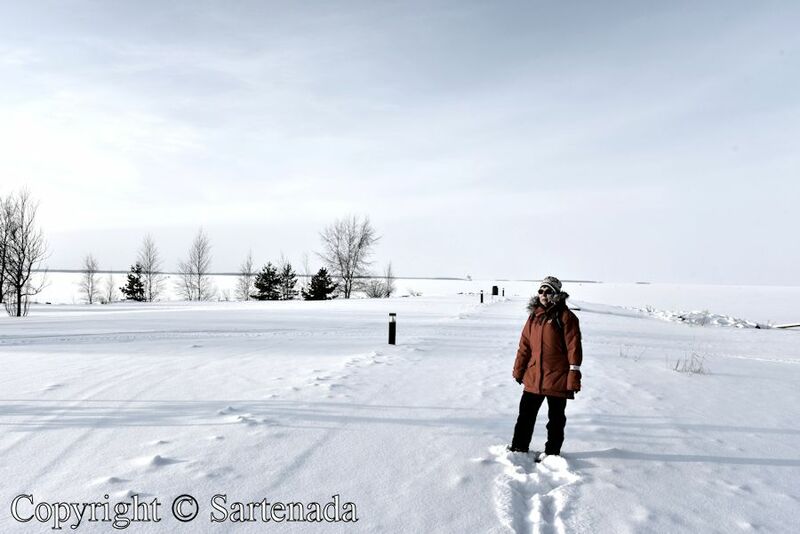 Thank You commenting my winter / snow photos presenting the beach of Nallikari in Oulu. 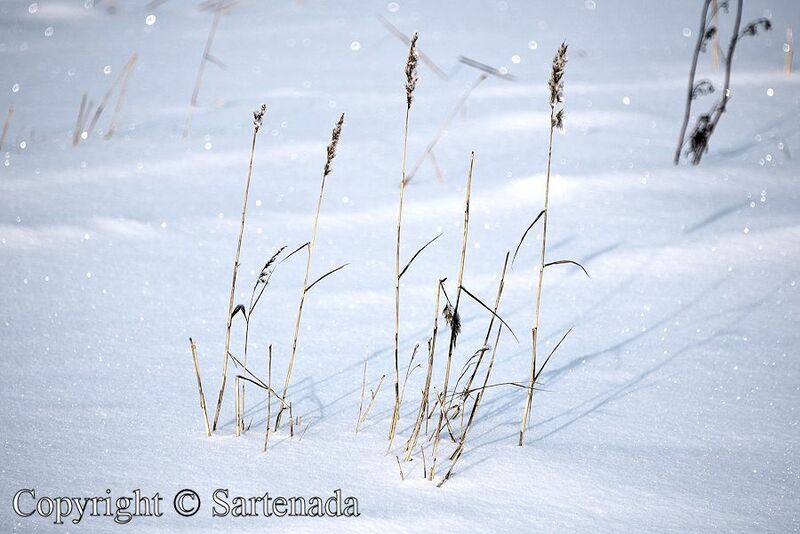 Thank you for the absolutely wonderful photos of this winter wonderland. What was the temperature when you were there? How nice to read Your lovely comment. Thank You. Brings out the child in us. 🙂 Where’s my sledge? Very nice that You got lovely memories. Well, we could not find Your sledge, sorry. 🙂 Thank you commenting. I haven’t seen so much snow for many, many years. Your photographs are so beautiful and atmospheric. Snow is beautiful, as You noticed. I am glad that You left Your kind comment. White pure snow is beautiful. Thank You for Your kind comment. Yes, it is quite popular in Finland on lakes, although these were on the sea. You hit the nail! Thank You for Your visit ad leaving Your kind comment. To me that looks like a fascinating day out! I am very glad that You visited my post and loved it. Thank You. How nice to read that You loved my photos. Thank You. How wonderful that you can share this winter perception with people all over the world! Thank you! I know you are both well wrapped up and the sun is shining, but it does not even LOOK cold! Yes, indeed we were using very warm outdoor jackets, windproof pants, warm boots and socks, mittens, warm winter hats and gloves. Thank You for Your kind comment. I am sure, that we will have beautiful spring and warm sunny summer. Your visit and kind comment warmed my heart. Thank You. Because we have winter and snow during many months, it is natural that people bike in winter also. It is very environmentally friendly way to move inside a town. 🙂 Thank You. Snow is beautiful, but cold 🙂 Very nice winter pictures! I saw snow twice this winter, in Finland in December and last week in Switzerland. It was cold, but not too cold. 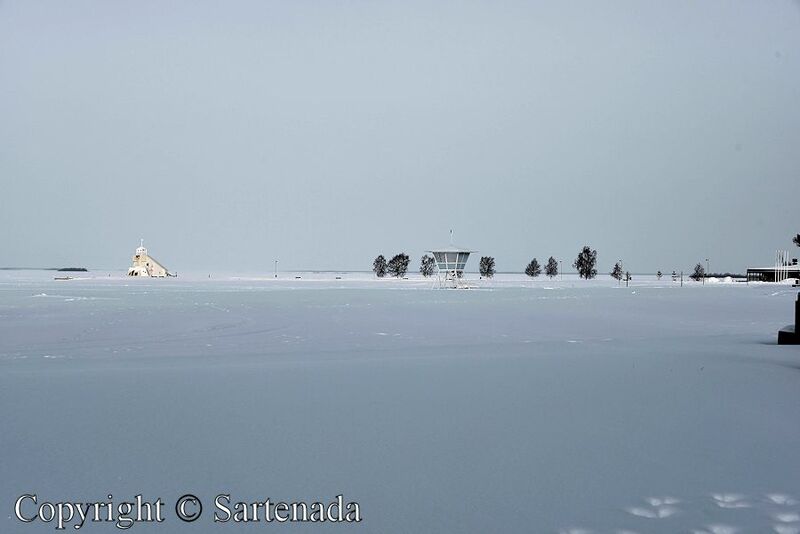 Ice from the Lake Saimaa started to melt yesterday. Thank you commenting. Thank You commenting. Snow will leave in two weeks and ice much later. All depend about weather. We just have had cold, but now the situation in changing- warm will come in few days. 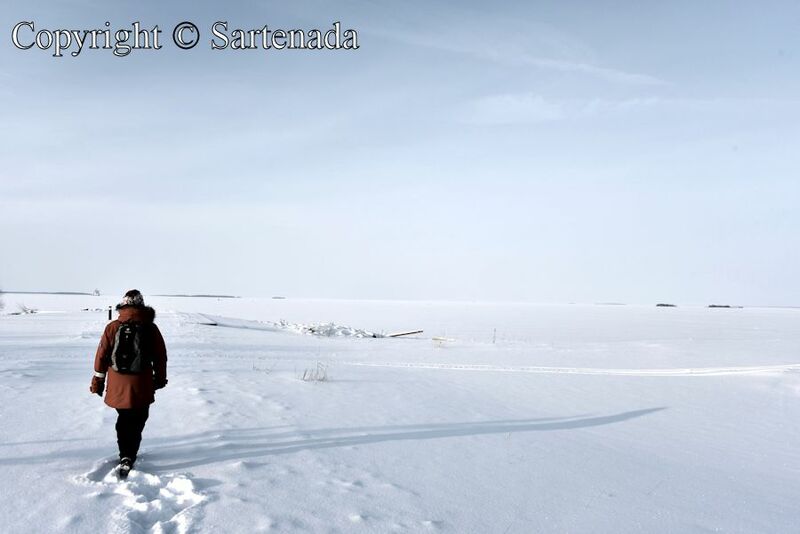 Fascinating how winter is white in arctic Finland! Snow is white when in the North! I am glad that You love my photos. Thank You commenting. Great pictures! Very cold indeed! Thank you for sharing your beautiful winter wonderland with us. I enjoyed your winter day at the beach. This beach is beautiful in in winter and in summer. I am glad that You left Your kind comment. Thank You. Winter can be beautiful indeed. Pure white snow with sunshine mute man with its beauty. Thank You commenting so nicely. Looks like a very moody day. Does the sea freeze where the shallow water meets the beach? 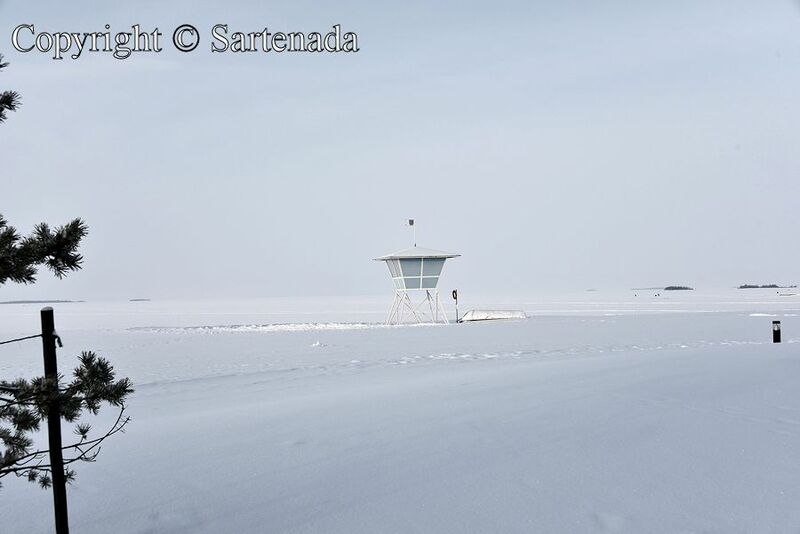 Sea freezes when it is enough cold and it starts from the beach. 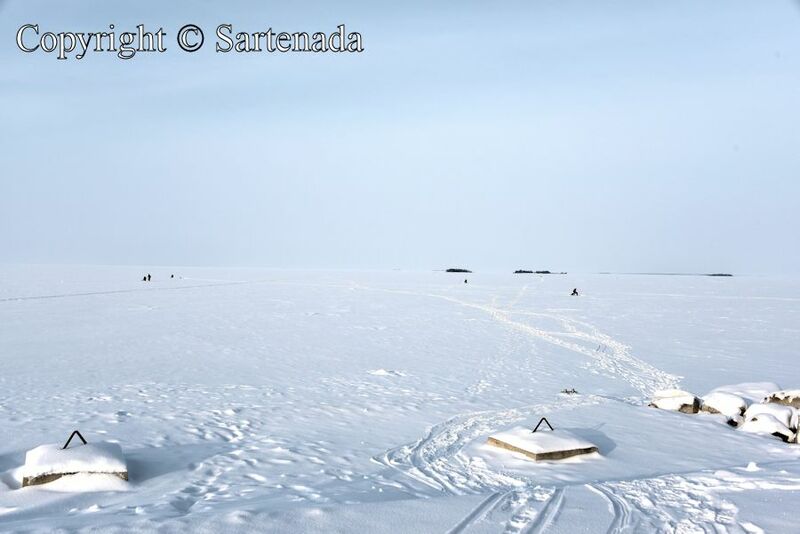 In the North, like this beach, it is thoroughly frozen in January and February. 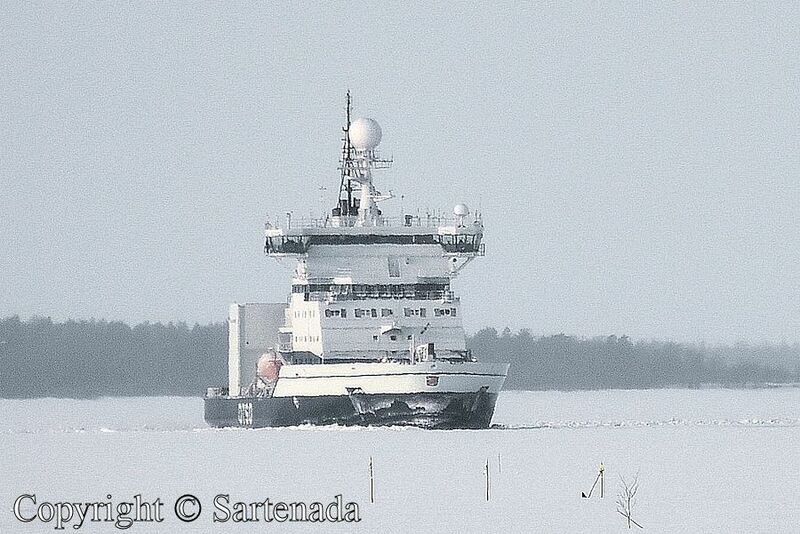 For example in Kemi, 100 km / 62 mi to the north of Oulu, cruises on an icebreaker start sometimes in January. Melting starts sometimes in March. Thank You commenting. I am very glad that You saw my photos and loved them. Thank You for Your praising comment. Wow, beautiful photos! 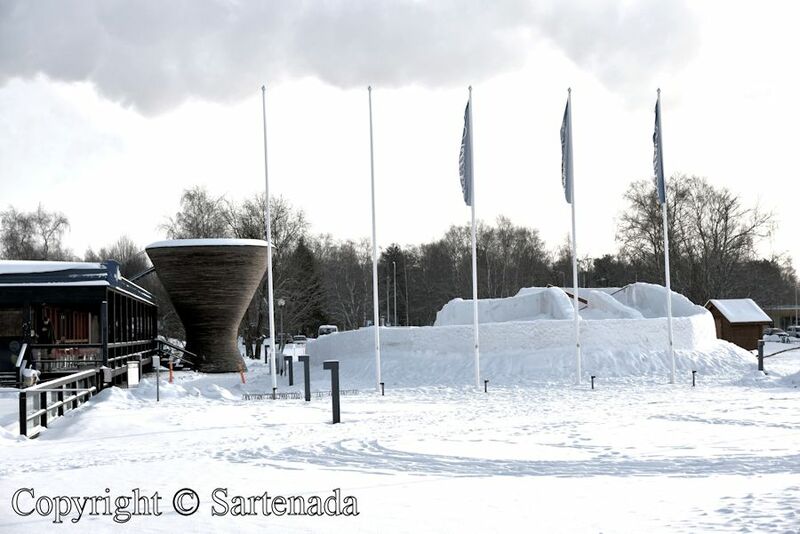 Brought back many memories of when I was in Finland in 1985…seems like an eternity ago. Thank you for Your praising words. Well, 1985, Years pass so rapidly in our life that we have to stop to think what has happened. Two years after 1985, I got married and new life started for us. It has been wonderful time full of happenings. 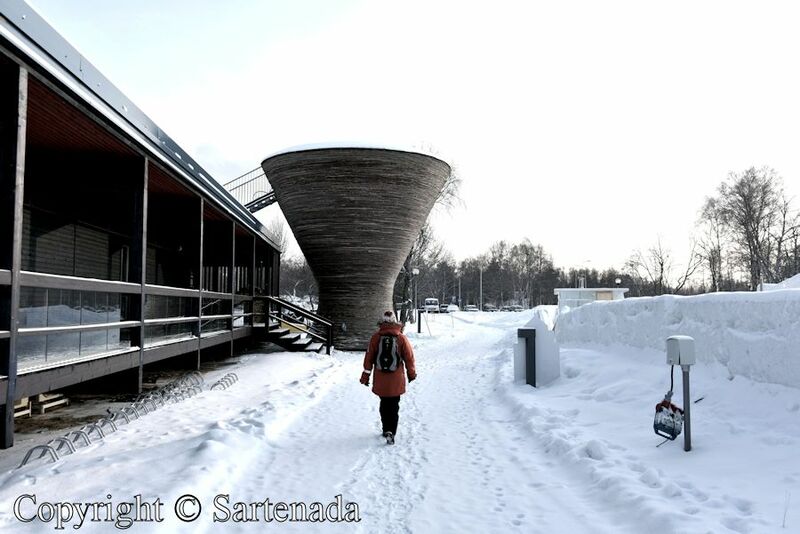 Where did You visit then in Finland? Well, it happens. Oulu has best biking routes in Finland. Here is my previous post: Winter biking. Thank You for Your kind comment. Yes, sir. Those bikes we call fat bikes. Very nice that You find some interesting things among my photos. Thank You commenting. We didn’t get much snow here in Scotland. Snow photographs are nice but it looks very cold. So, there is snow in Scotland anyway. Yes, it was cold, but clothes helped that it did not felt cold. 🙂 Thank You. Great comment. Thank You. I publish y post twice a month, so You did not miss many, I guess. Oh this is just wonderful! I love going to the beach in the winter (more than in the summer!) but I’ve never seen anything like this, especially the bicycles!! When next winter starts, I will post “special report” about winter biking. My post is already ready, but as I said, I will publish it later. 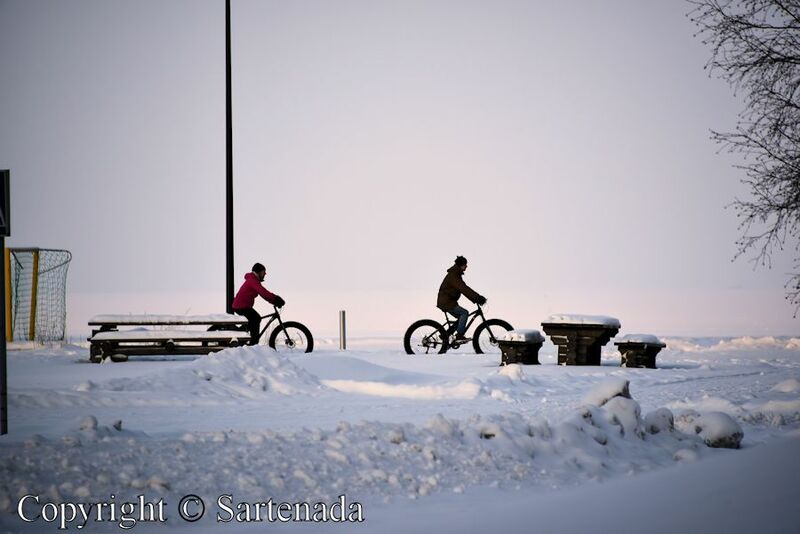 All photos are from Oulu in which winter biking is popular. I am glad that You loved my post. Thank you. Looking forward to it – Happy Midsummer to you too! My goodness! What a stark but beautiful contrast to the summer photos! Even so, it looks as though there are plenty of opportunities to enjoy the area. Thank You for Your kind comment. I checked where New Smyrna Beach is. I have not visited. We have visited in Florida, West Palm Beach and Lantana and riding around in Florida. Gorgeous place there. Thanks. Looking forward to seeing more of your great photos! I am glad that You loved my photos. Thank You leaving Your kind comment. I hope that next year brings You all the good. These are lovely. I especially like the the ones with the bathing cabanas.